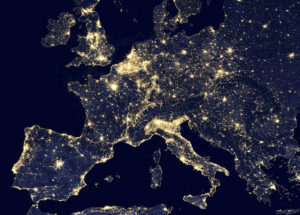 A nighttime view of Europe, Suomi National Polar-orbiting Partnership (Suomi NPP) satellite, source: NASA/Reuters. The future of the European Union is currently debated and questioned by the European political forces. The result of this debate will be the new European political normalcy for decades, and will heavily influence Romanian society. Unfortunately, the Romanian political parties are confused and lack a clear and cohesive vision on the social, economic, and political implications of the European project. At this crossroads, DEMOS firmly stands for strengthening the social dimension of the EU, the national and community democratic mechanisms, as well as their capacity to protect fundamental rights and freedoms. Over the past few years, the Union has mainly focused on consolidating the European Single Market and on neoliberal economic reforms that have eroded welfare and solidarity in the Member States. The weakening of democratic mechanisms, the undermining of employees’ rights, the austerity in times of recession, the imposition of market principles and of privatization on public goods, the disregard for poverty in both Eastern and Western​ Europe are just a few of the damaging consequences of this political direction. The Brexit referendum, the rise of right-wing eurosceptics, the isolationist practices of the Visegrad Group countries (The Czech Republic, Poland, Slovakia and Hungary) are the perverse effects of this imbalance, with the eurosceptics promoting the simplistic and mistaken idea that the political failures in EU countries can be exclusively explained by the Union’s deficiencies, and that the weakening or dismantling of the EU will solve all these problems. While not considering the EU a perfect or ideal construction and taking note of the inadequacy of neoliberal policies, we affirm that breaking up or reducing the Union to irrelevance would be a disaster of historic proportions. The multiple crises affecting the EU can be an opportunity to reduce the gap between the two Europes: Europe-the-market and Social Europe. Beyond all its problems, the EU has been the main pillar of peace and prosperity on the continent in the post-war period and of democratic construction in Eastern Europe after 1989. These are accomplishments upon which we can rebuild a more democratic and solidarity-focused Union than the one existing today. A restating of Romania’s position towards the EU should start from the principle that the Union is not just a market, rather a space of values, of which social cohesion becomes essential in the new economic and geopolitical context. Hopelessness and the lack of opportunities for a considerable part of the European citizenry, especially on the periphery, is real and should be admitted as such by those responsible at the Community level. Yet the strategy applied so far, promoting austerity and the dismantling of Social Europe, with the excesses of the majority of the Central and Eastern European countries, including Romania, cannot continue. On the other hand, Brexit-type scenarios or hostile reactions towards any kind of continuation of the integration process will only serve to deepen the crises, especially the social crisis. Romania is a European country, with strong ties to the continent based on its history, values, interests, and, most importantly, millions of citizens working and educating themselves in other Member States. The transition has yet to bring an equitably distributed prosperity to Romania. For instance, the level of wage inequality is higher at present than in 2007, when Romania became an EU member: https://goo.gl/kxeetb. According to Eurostat, Romania continues to be one of the countries with the highest risk of poverty or social exclusion (37.4%). European integration has brought work opportunities to many citizens, but it hasn’t created mechanisms to protect these citizens; it opened a common market, but it did not encourage producers’ access to it. The responsibility for failing to build a high-performing system with high levels of integrity, and of a socioeconomic system that would reduce the huge social gaps separating us from western societies resides, however, with the Romanian political and economic elites. The fact that other countries in the region (the Czech Republic, Slovenia or Slovakia) consistently report social cohesion indicators well above the average Union levels shows that being from the East, being a formerly communist country, does not necessarily mean you are condemned to a socioeconomic system that excludes the greater part of your citizens. Social investment and low inequality complement an economy based on high productivity and high wages. The socioeconomic system of stagnation and inequality that the Romanian elites have maintained is not an inexorable fate but a regrettable political decision. Therefore, it is fundamental for us, as a country, to stay close to the European project. We must both support the necessary reform of the EU and start a major economic and social growth process, one that will foster inclusiveness, bring prosperity, social justice and equal opportunity to all Romanian citizens, regardless of their place of birth or residence. The two dimensions are interconnected – without a strong Union, especially on the social level, building a more prosperous and inclusive Romania will not only be difficult but close to impossible. In Romania, capital returns represent around 60% of the gross national income, and the workforce only gets around 40%, the reverse of what usually happens in older Union Member States. We believe that reversing this ratio cannot be done without a more social Europe, regardless of the amount of political will on the national level. From this point of view, the European strategy of Romania, as a less developed country with more social inequality, should be that of creating transnational alliances with the European actors demanding a more social Europe. Strengthening the social pillar of the EU, with special attention paid to employee rights, as well as to the rights of those excluded from the labor market and those who are socially disadvantaged and marginalized. Specifically, we have to promote standards for social protection, strict punishments for employers’ abuse, collective bargaining between employers’ and trade unions, regulation of workers’ rights through European law, gender equality, access to social housing and social policies meant to reduce poverty. The regulation of social rights through soft legislation and that of macroeconomic and financial policies through hard legislation on the Community level is exactly the kind of imbalance between Europe-the-market and Social Europe that we have to correct. Adopting a European New Deal, possibly starting from the European Fund for Strategic Investments (or the Juncker Plan), but one that aims for the disadvantaged regions of the Union. In this sense, we propose founding a public bank for development in Romania, which would harness the massive financial resources of the Juncker Plan. According to the White Book regarding the Future of Europe, 18.6% of european youths under 25 will be unemployed by the end of 2017: https://goo.gl/Cro2pB, see p. 9. As such, the Unions’ Youth Guarantee, which is currently underfinanced, needs to be significantly increased in order to allow for the creation of decent jobs for the massive percentage of young people in unemployment. Consolidating free circulation of citizens and their social, cultural, and economic rights on the European level, as well as the creation of strategic socioeconomic partnerships with the countries with large communities of Romanian citizens in order to protect their rights and stimulate their economic activity in the respective countries and in Romania. The explicit and formal relaxation of the rules of the Stability and Growth Pact regarding the exceeding of budget deficits in times of recession, in order to allow for investments in social infrastructure, public transportation, education and research, which improve working conditions and stimulate the growth of added value to the economy. Without substantial reformulation of the neoliberal principles that the Stability and Growth Pact and of the Maastricht Convergence Criteria, as well as of the strategies that produce precarious work forces, Member States will not manage to generate inclusion and social equity, and will thus keep fueling the eurosceptic right-wing populism. Consolidating the cohesion policy in all its dimensions – social, economic and territorial – with an accent on developing local economies, protecting the environment and creating decent jobs. Reorienting the Common Agricultural Policy from big farmers towards those who provide decent employment, a fair distribution of income in this sector, as well as high environmental standards: small and medium farms and producers, cooperatives. Measures to improve the access of small agricultural producers to the urban markets and modern retail are needed. A Community-level fiscal reform. The countries with the least just distribution of income, such as Romania, are those who have the lowest level of collected budgetary income. It is in Romania’s best interest to escape this vicious cycle through fiscal harmonization at the Community level, as only through Union-wide coordination can we fight issues like transfer prices and tax avoidance through use of fiscal paradises. Romania has to support a more severe regulation in the whole EU of the following: a. illicit financial flows, b. the option to legally withdraw from paying taxes, the solution being Country by Country Reporting, c. taxes on cross-border financial transactions and deterring measures on financial placements in fiscal paradises. Big capital is organized at a transnational level, so appropriate taxation cannot be implemented at any other level, which means we need to deepen fiscal integration in the EU. A common industrial policy to consolidate the European economy in a global context, in which big players are supporting their exporters increasingly aggressively and are blocking imports, threatening wages, jobs and work conditions throughout the Union. From this point of view, transforming the European Investment Bank into a development bank and coordinating it with national banks for socioeconomic development can be the financial basis for this initiative. As it finds itself on the semi-periphery of Western industrial production, Romania is particularly exposed to the risk of relocalization of production that seeks out modest wages and work standards. An active industrial policy, with adequate instruments and with the reconsideration of the state aid policy is necessary to strengthen the foundations of the Romanian economy and to allow for wages that are appropriate for the Romanian cost-of-living. Supporting the transition towards renewable energy sources, improving the quality of the energy transport infrastructure, access to clean and cheap energy for household consumers. Active measures to fight global warming, to fight pollution and to protect biodiversity. A policy of openness and solidarity to those fleeing war, persecution and famine and who seek protection in the EU, as well as aid to the countries on the European border that receive them. Reevaluating the ‘Bologna Declaration’ and of the harmful transformation of the European higher learning system according to market principles primarily centered on competitiveness and the founding of a ‘knowledge economy’. A direct result of the Lisbon Strategy, the Bologna process has forced a neoliberal vision that targeted standardization, privatization and instrumentalization of the European educational systems in order to globalize production and financialize the economy. These reforms have not taken into account the cultural, social and critical components of learning, preferring to focus on a perspective centered on competitiveness and market mechanisms. The creation of a European Space for Higher Learning cannot turn a blind eye to the gaps between Eastern and Western Member States in terms of investment to the educational infrastructure. In the absence of adequate policies in this field, Eastern European countries risk to stagnate as periphery economies, that primarily supply EU investors with a semi-qualified and cheap workforce. The defensive reactions and the moral critique that are specific to right-wing eurosceptic populism are not solutions to the problems that the EU members are facing. Only measures to consolidate the social Europe – such as those mentioned above – would be able to ensure European citizens that the Union can be a source of systematic and effective protection against the dislocation and disparities produced by the common market and by the changes in the global economy. The European Union is a continuous guarantee that authoritarian missteps can be limited, that fundamental rights are respected and that there are robust protection systems for individuals and communities. Romania has an important maneuvering margin, but it also has a greater development gap to overcome. It is up to us to mobilize in a bigger project, in which the Union can be both framework and pillar of support.